The Amateur Traveler talks to Phil Smy about his second home in Kyoto, Japan. Japan was a country I never wanted to visit. In between getting off the plane in Tokyo and getting on the bus from the airport to go into town, I was in love with the country. Japan is organized and meticulous and perfect. 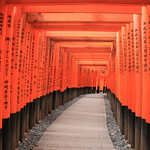 Kyoto is the number one tourist destination outside of Tokyo in Japan. It survived unspoiled, pretty much, from the Second World War so it has all of its history. It has an awful lot of history to present. 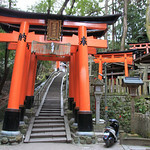 The former capital of ancient Japan, it is history and I think you get a real sense of Japan’s psyche by going to Kyoto. Phil talks about the temples, palace, geisha culture, and food of Kyoto. I’m happy to see that despite the recent natural and human catastrophes in Japan, you are doing a show on travel in the country. I lived, studied, and worked (in tourism and hospitality) in Kyoto for four years and went to the city after 3/11 to get away from the post-catastrophe hassle in the greater Tokyo metropolitan area. However, I was a little upset with the quality of the information given on the show. There were two points in specific that had incorrect information. The first point was that the imperial family still goes to the Kyoto imperial palace. They do not. The Kyoto imperial palace is not even fitted with electricity, much less with heating and cooling, a modern kitchen, etc. Therefore, the imperial family never goes there. The second point was that the temple buildings Phil mentioned were at least a few hundred years old. The Golden Pavilion is not. It as burnt down in 1950 by a mentally unstable monk. This event is creatively depicted by Mishima Yukio (perhaps the most famous 20th century novelist after Oe Kenzaburo) in his book The Temple of the Golden Pavilion (http://en.wikipedia.org/wiki/The_Temple_of_the_Golden_Pavilion). Other than that, I was unimpressed with Phil’s opinion of Nijo castle. The castle building itself has nightingale floors, meaning the castle residents could hear every footstep when someone approached, the paintings on the sliding doors are absolutely beautiful, and the in some places 1 meter thick carved wooden ventilation panels above the sliding doors have different motifs on either side, just to name a few points. Finally, I would hate to mention all my own favorite spots in Kyoto, simply because it’s so nice the tourists don’t crowd them. However, in the far north is Kamigamo Shrine, an ancient and very important shrine that historically was presided over by an imperial princess. Tucked into the northern hills right near the Kamo River, it is incredibly tranquil and shows a beautiful unification of the rugged natural qualities of the location with graceful architecture. The Kamo River, is also the perfect place to go for a morning run or to take a beer (bought at a nearby convenience store perhaps) on a hot summer evening. I occasionally talk about these things on my blog, if you’re interested. All the best from Japan! I love japan very much.would like to travel someday. Enjoyed this episode. 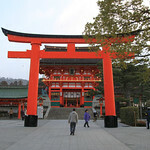 A bit more on the temples would’ve been nice, since they are the lifeblood of Kyoto after all. I don’t think your guest mentioned this, but one interesting thing in Japan is to notice the contrast between the Buddhist Temples and the Shinto Shrines. The religious syncretism there is interesting. For example Shinto is traditionally lighter and associated with things like weddings, whereas Buddhism is more solemn so Buddhist priests preside over funerals. Geisha are quite hard to spot in Kyoto so one can take the Kyoto Walking Lecture by Peter MacIntosh (http://www.kyotosightsandnights.com/walking.html). He helped with the production of Memoirs of a Geisha and knows a lot. I also don’t think your guest mentioned that booking well ahead of time is advisable for the Imperial Palace, since it is still Imperial property. I didn’t do this and so was unable to visit it. There’re also some Imperial Palaces or Lodges on the outskirts, but those are somewhat harder to reach than the Palace, which is in the city. Also the commoditisation of the temple/shrine experience in Japan is interesting. More or less all of them have stalls selling charms (among other souvenirs), and you’re supposed to come back and burn your charm within a year and give thanks if your wish came true: or bad luck will befall you. I didn’t bother flying back to burn any of mine, though! I like long journeys and i like japan and i want to visit the japan. Japan has an amazing atmosphere and people there have such a unique view of life. If you want to jump into the country’s history Kyoto is definitely the best destination!